For this follow-up report, my standby pair of regular speakers -- the "conventional" dynamic nOrh SM6.9 synthetic marble wonders -- assumed woofie walking duties. Exclusively. The two VBT Magellan VIIIs on their purple leashes were coupled to one or two matching VBT-200 outboard amplifiers, for mono or stereo crapping - er, subbing on the floor. Why? My Avantgarde DUOs' midrange horns cut off far sooner than most speakers for which the VIII is designed. The nOrhs extend to about 35Hz, very powerfully too when in the vise grip of the Bel Canto eVo 200.4, strapped for all 360 of its strapping stereo watz. This arrangement would operate the Magellans in omni-directional mode, directivity inaudible. In fact, many listeners might even question the advantages of stereo separation below 40Hz to begin with. Their loss. First off, having two subwoofers independent from your main speakers does confer distinct advantages over those full-range main speakers which are outfitted with equivalent integral (passive or active) woofer sections. Positioning main speakers for best imaging usually does not exactly coincide with obtaining the most even, lump-free powerful bass. Or vice versa. Many an astute listener has silently wished for a band saw. Separate the upper and lower driver modules of his full-range towers. Place the monitors here for the most stunning, where'd-they-go disappearance act, focus and center fill. 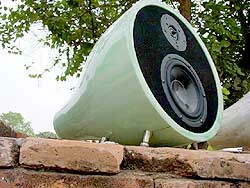 Park the subs over there, for the most potent bass liberated from room geometry constraints. Clearly, outboard subs offer the requisite flexibility to site bass and mid/treble transducers in optimized -- and thus different -- positions. Naturally, discrete subbing also allows tailoring of relative tonal balance to offset the thickening effects of room gain in the bass band. So far, so not at all new. This is well-known stuff, old audiophile kindergarten lessons. As, liably, are the predictable observations that neither frequency response linearity, amplitude or placement specificity of performers improve when going from twin-mono to stereo low bass. Imaging precision is an artifact of high-frequency cues, even when subliminally hidden in harmonics. Don't expect a sharper, more precise fix on your favorite bassist when supplying your second subwoofer with its own discrete signal. As Jim Smith of Avantgarde-USA explains very cogently in his famous 31 Secrets to Better Sound, the believable recreation of the recording venue depends almost entirely on direct and reflected long-wavelength infra-sonic cues. Those arrive at each microphone at slightly different times. Summing this information to mono simply cancels most of this data as out-of-phase information. Unfortunately, our ear/brain mechanism utilizes these differing arrival times of reflected ambient cues to recreate the size and shape of the original venue. Mono bass deletes this necessary data to no longer plausibly superimpose performance space on listening space. Rather than merely transplanting the performers, to hear/feel/see Carnegie or Avery Fisher Hall, Yoshi's or Birdland's in your living room requires stereo - all the way down to the limits of low-frequency sensory perception (which isn't always just auditory). I already knew from prior experimentation that infra-sonic spatial information is present even on recordings without any obvious constituents below 100Hz. Still, I had never bothered to ascertain just how much less acute audible space becomes when low stereo bass is reduced to mono, sans altering any other parameters such as placement, output or crossover frequency/slope. Today's experiment made this easy. I merely transferred the feed to the second Magellan VIII from one to the other VBT-200 amp, a swap made convenient and quick with the WBT-banana terminated Analysis Plus Oval 9. And? And what? Try it for yourself. You'll be shocked. What - you want me to tell you? In percentages of improvement preferably? Try 20-50% depending on recording quality and microphone setup. It's a very visual thing, this. Think properly lighting a stage without hot spots, half shadows or drop-outs. You'll see relationships - between performers and the boundaries of the space they're playing in. You'll be connecting these cues like astrologers, for context, connect stars into the animal forms of the Zodiac. You'll suddenly find yourself operating in the deep space of tacit three-dimensionality. 'Deep' changes from the immensity of light years to become a substitute for enhanced nuances of perception, a higher order of appreciation for what occurred in the former vacuum - between and around the musicians. This equates to a greater sense of realism, to a more literal implementation of higher fidelity. Plain and simple stuff, though likely well down the usual audiophile shopping list. Another gain, albeit subtle? It seems to occur in the spectral content of instrumental timbres with low-frequency components. They too sound more realistic - less static, more varied and full. The big thing, however and quite literally, remains space. As anyone adding a single subwoofer already knows, slipping a solid foundation beneath the midrange and upper bass accomplishes infinitely more than adding primitive boom-boom. It impacts depth, body, focus, harmonic density and even apparent treble purity. Adding a second subwoofer, in stereo and properly spaced for stereo, unzips and decompresses the spatial dimension. While the actual data required for recreating it remains very low in frequency and amplitude, the importance it plays, in the suspension of disbelief facing complete spatial holography, cannot be overstated. This becomes more true even when your subwoofers, like these Magellans, are quick and accurate to react to the tiniest of subliminal impulses. All of this speaks to the reptilian and ancient-most part of our brain. Even a very muted cracking branch or brush against bark could spell the difference, between bringing home meat or becoming some other creature's lunch. To avoid the latter required instantaneous localization of the warning signal's precise origin. And while audiophile survival these days is more a monetary than life-and-death consideration, our ear/brain mechanism still operates just as it did then. 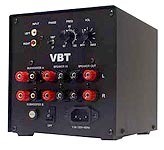 In today's review context then, the added cost of $450 to enter this survival domain -- with the second VBT-200 -- is a no-brainer. It's a highly recommended upgrade for those already committed to twin subbing for the other cited advantages: Increased linearity and output. However, don't do it just because you want "mo bazz". Unlike the second sub, the second amp won't give you that. We're not talking brute force but sophistication. If you want big'n'bad, one amp'll do just fine. Simply crank open its attenuator and rattle the china. If audible space were your poison -- finesse, teleportation --the second VBT-200 becomes mandatory. Then turn down the relative bass volume to obey realistic blending. The nice aspect about all of this? Since one VBT power module already can drive two passive Magellans, you can approach this final goal in financial stages. Weave your spider web over time, to capture that pesky insect of audiophile realism in all its twitching while struggling glory. So then. Was I correct presuming that this specific result of stereo bass wasn't exactly what you had signed up for when starting out on this follow-up review? I enjoy learning new things even after 10 years into this hobby. There's nothing wrong with the ignorance of not-knowing. Just let it become the power that motivates its own undoing.